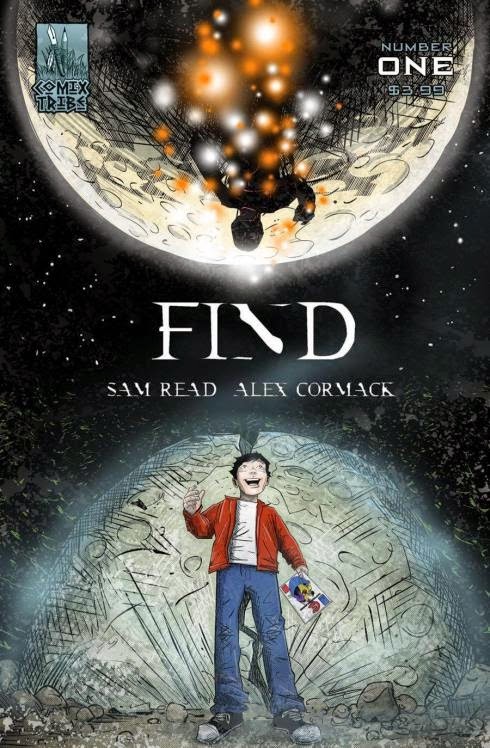 The Fellowship was fortunate enough to obtain a copy of FIND #1 from ComixTribe Comics. The story is written by Sam Read, illustrated by Alex Cormack, and lettered by Tyler James. Teddy Chance is a normal boy, having dreams of being appreciated and loved since he does not receive that from his parents. One night, Teddy observes an object fall from the sky and land in the woods near his house. He heads out to investigate. What he finds will change his life; but is it for the better or worse? Sam Read has crafted a great little coming of age story that reminds me of films such as Explorers and Iron Giant (and a few others). There’s something about Alex Cormack’s art that I like; very unique and nice looking. The colors of the issue (which I assume was also handled by Mr. Cormack) are amazing as well. FIND #1 is a one-shot, but written that further adventures can be chronicled. And I hope there will be. This is truly a wonderful tale that should be enjoyed by all who dare to dream. FIND #1 is in stores now, or available for ordering at www.comixtribe.com.